You’re supposed to be finishing your Christmas shopping. There are too many question marks still left on your list with the holiday just a few days away. You keep finding things that you love for yourself, though. These aren’t items that will end up wrapped under the tree with your name on them. So you treat yourself. One of the treats is even inspiring travel plans for the new year. Until you stumbled upon a bottle of Super Talbot, you didn’t realize that Maryland was a wine-growing state. But, to the north, New Jersey, Pennsylvania, and even Delaware produce wine. Virginia, to the south, does, too. So, of course, the Old Line State has vineyards. Vines were planted in the Chesapeake Wine Country, along the east shore of the Chesapeake Bay, as early as the mid-17th century. The state’s first vineyard eventually opened in 1945. The region only recently started to grow in size and stature. 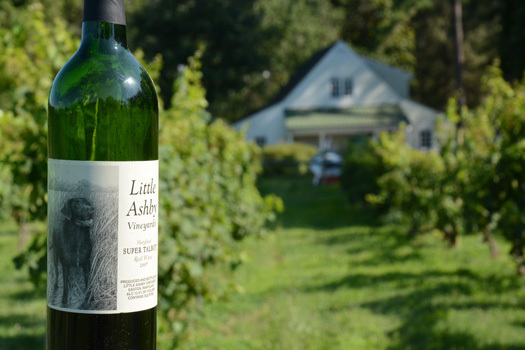 The Chesapeake Wine Country’s first licensed winery planted its vineyard in 1992. Maryland’s Eastern Shore was already known for its warm days and cool nights. The historic town of Easton, settled in the 17th century, was already considered one of the best small towns in the country. While the east bank of the Miles River, a tributary of the Chesapeake Bay, has an elevated riverbank and cool breezes. Gorgeous sunsets are a bonus, too. This picturesque scene is the home of Little Ashby Vineyards. The owner, a lawyer-turned-winemaker, loves Italian wines. He thought he could grow similar styles on the outskirts on Easton. So he planted Cabernet Sauvignon, Chardonnay, Merlot, and Pinot Noir grapes. He started making a Bordeaux-style blend. The big red wine has a deep color, nice tannins, and a dry finish. Then the Super Talbot, named after the county that’s the heart of the Eastern Shore, started winning awards. Lots of awards. The bottle, difficult to find due to its limited production, has become a big score for wine lovers. Now you have one. You plan to open, perhaps even share, it over the holidays. Then you hope to visit Easton and the little vineyard, which you can access by bike or boat, during your next trip to the Eastern Shore. The best gifts are ones that keep giving. You’ll be enjoying this find for quite a while. Now you need to quickly find just-as-exciting gifts for the rest of your family.